The only certainty about the communiqué that resulted from the third plenum meeting of the ruling Chinese Communist Party (中国共产党) is that you should trust no one who claims to have sometime certain to say about its meaning. But that hasn’t stopped a phalanx of Sinologists from Beijing to London and from Shanghai to New York from trying to divine the meaning of the communiqué and what it might behold for the next decade of Chinese economy planning under its new president and ‘paramount leader’ Xi Jinping (习近平), who’s also the general secretary of the CCP’s central committee. 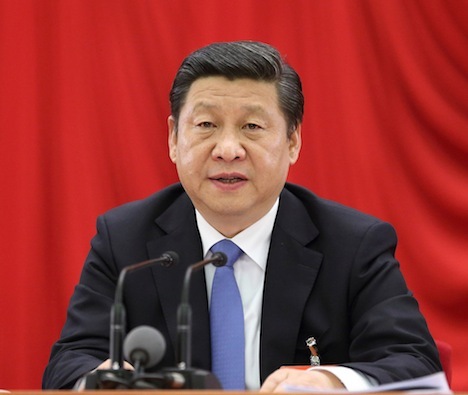 So far, Xi has spent much of 2013 waging an anti-corruption campaign at all levels of the CCP and Chinese government, and emphasizing a less ostentatious style of governance (‘four dishes and a soup‘). The most optimistic forecasters, both within and outside China, predicted that Xi and the party’s central committee, a group of the top 350 CCP officials, would move forward during the third plenum with a bold policy agenda that could give some policy substance to Xi’s ‘Chinese Dream’ rhetoric. China’s state-controlled media even encouraged this line of thinking. Perhaps Xi would finally end China’s one-child policy! Perhaps Xi would announce the transition to an even more robust private sector! Perhaps Xi would announce that the value of the renminbi would be determined by the market! Perhaps Xi would stand on his head, pardon former Chongqing part boss Bo Xilai, sing a couple of ‘Cultural Revolution’ songs from the Mao era, lift the ‘Great Firewall,’ and establish a timetable for Tibetan independence! No such luck — at least, so far as anyone can tell, though a more precise resolution will emerge in the days ahead. While it’s hard to find two analysts who agree on exactly what the communiqué foretells, . Xi is consolidating his power! Xi’s been stymied by the technocrats! It’s a triumph for the state sector! It’s a triumph for the private sector! 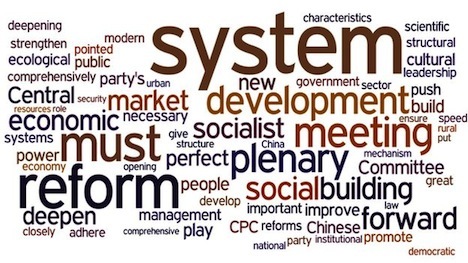 The Plenum stressed that the successful practice of reform and opening up has provided important experiences for completely deepening reform, and must be persisted in for a long time. The most important matters are persisting in the leadership of the Party, implementing the Party’s basic line, not marching the old road of closedness and fossilization, not marching the evil road of changing banners and allegiances, persisting in marching the path of Socialism with Chinese characteristics, guaranteeing the correct direction of reform and opening up throughout; persisting in liberating thoughts, seeking truth from facts, progressing with the times, seeking truth and being pragmatic, starting from reality in everything, summarizing domestic successful methods, learning from beneficial foreign experience, and daring to move theoretical and practical innovation forward; persisting in putting people first, respecting the dominant role of the people, giving rein to the pioneering spirit of the masses, closely relying on the people to promote reform, stimulating people’s comprehensive development; persisting in correctly handling the relationship between reform, development and stability, we must be bold, our pace must be steady, we must strengthen the integration of top-level design and crossing the river by feeling the stones, both stimulate overall progress and focus breakthroughs, raise the scientific nature of policymaking, broadly concentrate consensus and form joint forces for reform. In a small acknowledgment of the clamor for better protection of individual rights, the communiqué noted the need to establish an independent judiciary. But again it reaffirmed the leading role of the party, which has the power to trump China’s constitution. But vague has long been in vogue on the path of Chinese policymaking, especially economic policy. Is it any less vague for China specialists to make vague calls for Xi to ‘deliver’? What would that entail? Looking back, even today, can you list with certainty the five top policy legacies will be for Hu Jintao (胡锦涛) and the Chinese leadership between 2002 and 2012? Over the course of this week, we’ve watched US president Barack Obama apologize for the rollout and planning of one particular reform to one sector of the US economy. Yes, health care is a relatively large sector of the economy and yes, the government is already an important player in that sector, in light of Medicaid programs for the poor, Medicare programs for the elderly, Social Security benefits for the disabled and a separate care system for veterans and those in the armed forces. But it’s not clear if the Obama administration has any idea what will happen to the private health care insurance market over the next two months, let alone the next ten years. 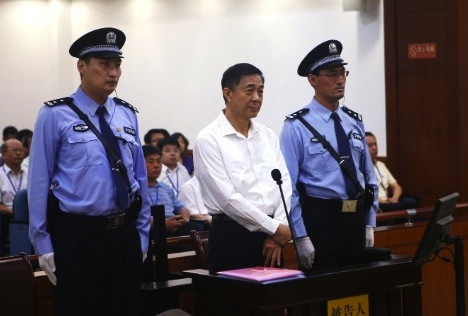 With the end of Bo Xilai’s trial, is Xi Jinping co-opting the ‘Chongqing model’? It’s been perhaps the most sensational rise and fall of a top Chinese official in a generation, but the corruption trial against former Chongqing party leader Bo Xilai (薄熙来) wrapped up this week with plenty of surprises, even if his guilty verdict for bribery, embezzlement and abuse of power, is all but assured. That Bo has been allowed to mount such a public (and political) defense is not surprising, given his status as one of the second-generation ‘princelings’ of the Chinese Communist Party (中国共产党). Even if Bo goes to prison for a decade or longer, the trial will have helped to cement his image as the leader of a ‘New Left’ movement within Chinese politics and society. But what does that mean for the ‘Chongqing model’ that Bo championed as party secretary in Chongqing from 2007 to 2012? The ‘Chongqing model’ is a vaguely neo-Maoist approach to governing China that involves a redoubling of state power and control, strengthening state-owned enterprises and aggressively attacking organized crime, while bringing back some truly unique vestiges of the era of former Chinese leader Mao Zedong (毛泽东), such as encouraging the singing of revolutionary-era songs. It’s often contrasted against the ‘Guangdong model’ — a leadership style that encourages private development to blossom instead of through state-sponsored economic policy and at least a passing respect for the rule of law and other institutional reforms. You can place the two models on the familiar left-right ideological axis — the Chongqing model prioritizes equitable distribution among all classes, the Guangdong model prioritizes the highest economic growth possible. In reality, however, the line between the two models is blurrier. Though the ‘Guangdong model’ is associated with the relatively liberal former Guangdong party chair Wang Yang (汪洋), now a vice premier (though not a full member of the Politburo Standing Committee) in Xi’s government, it was Wang who served for two years as Chongqing party chair as Bo’s direct predecessor. Realistically, the differences among China’s political elite remain smaller than their shared values. Just as there’s little chance that China will return to the days of Mao-era socialist state planning, there’s also little evidence that economic liberalization and reform has led (or will lead in the future) to greater political freedom.